^ 鄭嘉武; 鄧天德. 自然科學論集. 中國文化大學出版部. 1981. ^ 緻密小步舞曲— 重離子對撞，再現宇宙大爆炸. 泛科學. [2015-03-25]. ^ Feynman, Richard, QED: The Strange Theory of Light and Matter, Princeton University Press: 136, 1985, ISBN 0-691-08388-6, The idiot physicists, unable to come up with any wonderful Greek words anymore, call this type of polarization by the unfortunate name of 'color,' which has nothing to do with color in the normal sense. ^ The High Energy and Particle Physics Prizes. European Physical Society. [6 March 2013]. ^ 一鸿·徐. 膨脹的宇宙 愛因斯坦的玩具. 五南圖書出版股份有限公司. 2006: 150–. ISBN 978-957-11-4195-4. ^ R.P. Feynman. QED: The Strange Theory of Light and Matter. Princeton University Press. 1985: 136. ISBN 0-691-08388-6. The idiot physicists, unable to come up with any wonderful Greek words anymore, call this type of polarization by the unfortunate name of 'color,' which has nothing to do with color in the normal sense. ^ 清凉·林; 戴念祖. 力學 牛頓力學, 彈性、液體和熱力學. 五南圖書出版股份有限公司. 2005: 141–. ISBN 978-957-11-3889-3. ^ Fritzsch, op. cite, p. 164. 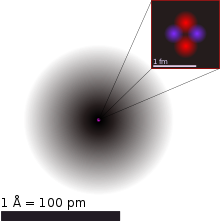 The author states that the force between differently coloured quarks remains constant at any distance after they travel only a tiny distance from each other, and is equal to that need to raise one ton, which is 1000 kg x 9.8 m/s^2 = ~10,000 N.
^ 林清凉. 近代物理 原子核物理学简介、基本粒子物理学简介. II. 五南圖書出版股份有限公司. 2003: 464–. ISBN 978-957-11-3227-3. ^ Fritzsch, H. Quarks: The Stuff of Matter. Basic Books（英语：Basic Books）. 1983: 167–168. ISBN 978-0-465-06781-7. ^ 不可不知的万物简史. 青苹果数据中心. 21 December 2013: 172–. GGKEY:6LWLFHQ8UDF. D.J. Griffiths. Introduction to Elementary Particles. John Wiley & Sons. 1987. ISBN 0-471-60386-4. F. Halzen, A.D. Martin. Quarks and Leptons: An Introductory Course in Modern Particle Physics. John Wiley & Sons. 1984. ISBN 0-471-88741-2. G.L. Kane. Modern Elementary Particle Physics. Perseus Books（英语：Perseus Books）. 1987. ISBN 0-201-11749-5. R. Morris. The Last Sorcerers: The Path from Alchemy to the Periodic Table. Joseph Henry Press（英语：Joseph Henry Press）. 2003. ISBN 0-309-50593-3.